An enormous pit and cave system, known as the Abyss, is the only unexplored place in the world. Nobody knows how deep down it goes, inhabited by strange and wondrous creatures and full of mysterious ancient relics which purpose in unknown to modern humans. Insatiable curiosity drives humans known as Cave Raiders to venture down into the pit. A little orphan girl named Riko lives in the town of Orth on the edge of the Abyss, with dreams of becoming a legendary Cave Raider like her mother. One day while exploring the murky depths she stumbles upon a little boy, who turns out to be a robot. 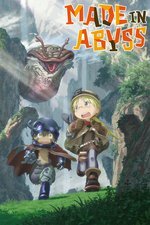 Tantalized by the mysteries of the Abyss, Riko and her new friend descend into uncharted territory to unlock its mysteries, but what lies in wait for them in the darkness? Thanks to lucidium for this FPP which introduced me to this anime. I just finished season 1 and I loved it. Fair warning: The show comes off as cutesy at first, but it gets very graphic in terms of injury and harm. Also, really emotionally gut wrenching stuff. Thanks numaner! I resisted the urge to gush about the show too much in the post, but I love everything about it. The art and colour is so pretty, the first episode especially is like a film. A great OST is a huge part of what makes an anime for me too, and this one has so many awesome background tracks, let alone those insert songs. Even the sound effects are interestingly different, almost jarringly crisp. It really does ramp up in the last few episodes - not that there's any lack of action before that, but man. Episode ten is just unrelenting for ten solid minutes, Nanachi and Mitty's story, the new insights into the Abyss, Reg extracting the promise from Nanachi and then seeing the hyper competent survivalist break down, and that ending montage. Rewatching it for the post, I kept noticing new visual references and clever shots. Like the door framing Ozen (I love Ozen) when she's introduced at the end of episode 5 mirroring her hunched form, Nanachi's house and Mitty's room entrance both looking like Mitty, or the pov shot of Nat staring at Riko's mail package in the finale. I hope it goes deeper into the exploration of humanity and inhumanity, I like how it has a character representing almost every possible permutation. Riko given life by a relic, Reg being more human that most of the other people, Nanachi and Mitty obviously, Bondrewd couldn't be more inhuman, Ozen physically snaps back and forth. The way the people of Orth talk about death and "resurrection" from the Abyss is interesting too. This has interesting echoes of the Long Stair thread on rpg.net. Thanks for posting this. I am watching with my 13 y.o. son and we are both glad we were warned that this is dark. The animation is terrific. Obviously influenced by Miyazaki (and likely others, I am but a dilettante). Interesting the childlike style of the main characters (I found the very rounded features very off-putting at first) compared to the fantastically detailed features of the monsters like the winged creatures that they battle on level 2. My son loves the adventure story, but, as an adult I would have been completely satisfied with a leisurely tour of the many biomes of the abyss. it's a fascinating world that has obviously given the animators a great challenge to bring to reality. The second half of episode 10 and the first fifteen minutes of episode 13 are the most graphic parts in case you want to preview them. I think you're spot on about the animation, there are definitely some heavy hitters on the staff, and I believe the art director and background artist Osamu Masuyama came straight from Ghibli. In one of the interviews I've seen they mention deliberately highlighting the "gap" between the art style and the content too, and the monster artist is apparently notorious for the amount of detail he adds.